Physicians who accept or are assigned leadership positions are often left on their own to develop leadership skills and educate themselves about their responsibilities as medical staff leaders. Just because a physician is a great clinician does not mean he or she is a great leader. The challenges of being a successful medical staff leader are twofold: You must be well-versed in your role and responsibilities (i.e., peer review, credentialing, medical staff bylaws), and you must inspire other medical staff members to follow the rules while continuing to deliver excellent patient care. A well-trained medical staff leader is vital to the culture of a hospital’s medical staff and can save a hospital from the expense of lawsuits affiliated with negligent credentialing/peer review. 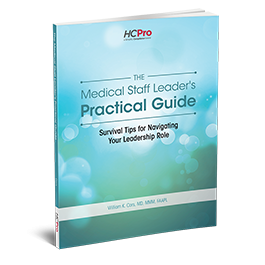 The Medical Staff Leader’s Practical Guide: Survival Tips for Navigating Your Leadership Role offers you an affordable, time-saving solution to medical staff leadership training. William K. Cors, MD, MMM, FAAPL, is an experienced physician executive with a background that includes 15 years of clinical practice, more than 20 years of executive hospital/health system management experience, and extensive experience as a healthcare consultant. He currently serves as the chief medical officer for Lehigh Valley Hospital-Pocono in Pennsylvania. Formerly, he was the vice president of medical staff services for The Greeley Company, Inc., in Danvers, Massachusetts and worked with national hospitals and medical staffs. Cors holds an AB degree from College of the Holy Cross in Worcester, Massachusetts; an MD from Rutgers New Jersey College of Medicine in Newark, New Jersey; and a master’s in medical management (MMM) from Tulane University in New Orleans. He is a fellow of the American Association for Physician Leadership (FAAPL) and is board-certified in both neurology and medical management. In addition to working with medical staffs, hospitals, and boards across the country, Cors has also authored numerous books and articles. Since 2007, he has written a monthly column for HCPro’s newsletter, Medical Staff Briefing, on a wide range of medical staff topics. In addition, he has co-authored books including The Medical Staff Leader’s Practical Guide, Sixth Edition (2007), The Greeley Guide to New Medical Staff Models (2008), The Greeley Guide to Physician Employment and Contracting (2010), and An Integrated Approach to Marketing Orthopedic and Neuroscience Service Lines (2013). He was also the author of The Medical Staff Leader’s Survival Guide (2014) and The Medical Staff’s Guide to Employed Physicians (2016).